Where do we get such men...and women? I don't want to flog a crippled horse, but I became more disturbed as I drove down the coast highway toward Chinook, Washington and the Columbia River. I found the drive from the hauntingly beautiful Ruby Beach with its remote stretches of soft sand, gentle tidal pools, whispery inlets and silvery sculpted driftwood to be unpleasantly disrupted by the increasing number of hillsides stripped of stately, shadowing firs. 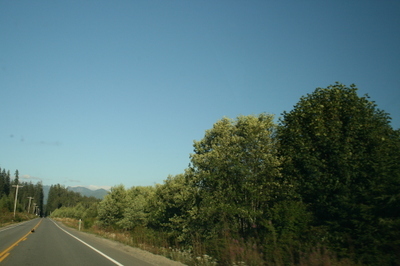 At first, I thought this kind of roadside logging was an anomaly, but as I proceeded south, I saw acre after acre that had been cleared of the beautiful conifers that cradled my leisurely drive down the lonesome highway...always with the dark and distant mountain peaks watching from the faraway horizon. Not far past the small hamlet of Humptulips (see previous posting), I encountered a short straightaway. In the knee-high grass off the highway to my right stood a doe, contemplating a crossing. At the time, there was nothing behind me, so I stopped to take a picture of the young deer. Suddenly a car came into view, rounding the corner rather fast. I wondered if I'd be a reluctant witness to a leaping doe striking streaking metal. But no, luckily. the driver slowed to a stop. The deer stood immobile. Then the doe slowly sauntered across the road, reaching the other side safely, almost purposefully strolling up into the high grass. The oncoming car started up, and went slowly past me. The driver waved, and I waved back, standing by my car with camera in hand. Although the doe made a safe crossing, I was less than successful as I proceeded down Highway 101. A few miles past Humptulips, it began to get dark. I'd vowed that I'd pull off and seek a place to spend the night sometime between 6 and 7 each evening. I came to the pleasant little town of Aberdeen, near the eastern shore of Gray's Harbor. Being of Scots descent, I took this for a sign. I stopped, found the Olympic Motel (pleasant, inexpensive, near a fairly good local restaurant), and bedded down. The next day began with detours and lots of construction and confusing signs trying to get out of Aberdeen and cleaving to Highway 101. Road signs were scarce, and impatient drivers were plentiful. I bumbled my way along. Just outside Willapa National Wildlife Refuge (worth visiting), I missed a turnoff I'd planned to take onto Route 4. This would have led me along the northern edge of the Columbia River until I reached Brush Prairie, Washington, where I intended to take a right and drive a short distance to a bridge that would cross the Columbia and bring me into Portland. So much for the best-laid-plans department. I missed the turnoff to Rt. 4, maintaining a beady-eyed faithfulness to Highway 101. It seemed to me -- and the compass on my trusty van -- that I was heading west, and I wanted to be heading east. As I went along, I was struck by the sight of a lonely-looking blue church by the side of the road. It seemed deserted, inactive. But throughout my entire trip, I've been attracted by churches. There is something about the spires, pointing upwards, stretching toward heaven, representing hope and faith and aspiration, that never fails to make my heart swell. At the Seaview Visitor's Center, one of the sweetest, gentlest ladies I'd encountered so far -- Pinky by name -- told me I was far from Rt. 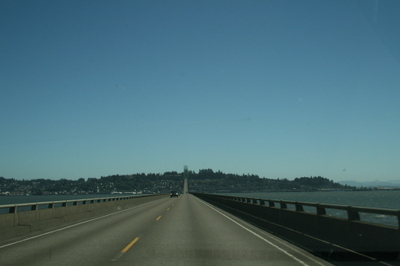 4...that I'd be better off to get back on Highway 101, follow it past Chinook into Megler and cross the long bridge to Astoria, Oregon. From there, Pinky said, "...you'll find just the kind of country road you're looking for. It's route 30, lots of bends and curves and hills, and you'll love the countryside. That's the way my husband and I go when we go to the Good Sam (for Samaritan, I later learned) hospital down to Portland. 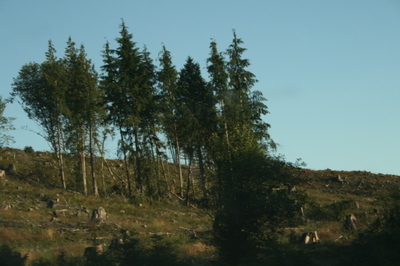 We don't have to go there too often, knock wood, but we do like the drive. I think you will, too. I don't go in the hospital. I just stay in the car. My husband goes in. He's good, though. He's just moved too many pianos in his life. I used to help him, but we're both a little too old now. Now did you eat lunch yet? Well, you go just down the road there to the Shelburne Inn. There's a good restaurant there called, I think, Shoalwater's. You'll like it. And then you be sure to come right back here and tell me if you liked it. Because if you didn't, then I'm not going to tell any more good folks to go there." I reported back to Pinky that I liked the restaurant plenty -- I ate outside in the garden -- and had a crab sandwich that looked suspiciously like a hamburger until I bit into it. "However," I said, "the desserts -- I had a piece of berry pie -- were about a quarter of the normal size of a slice of pie. Seems I got cheated." And so I drove on, past Chinook, to the bridge at Megers and the Columbia River. Oregon was within sight. Oh, how I love Hwy 101 in that area!! And, you certainly seem to encounter more than your fair share of "characters!" Pinky sounds spunky!! Thanks for taking us along! Hi Kent. We just returned from eight weeks in New England. Drove almost 5000 miles. Spent this afternoon paying past due bills and catching up to you on your westward trek. Have a great idea I'll save for when we talk, Don't know where your trip is taking you now, but we think the ride down Rt 1 on the Oregon coast is one of the most beautiful in the ole USA. Be well, drive safely, write prolifically. What a lovely, fun lady Pinky is! And more beautiful country to ogle!